December 17, 2012  The preservative thimerosal keeps vaccines from going bad in places where there is no refrigeration. Anti-vaccine activists say it should be banned because it contains mercury, but public health officials insist it's safe. 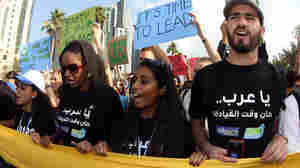 December 7, 2012  The urgency of taking action on climate change couldn't be higher, according to commentators Asim Zia and Stuart Kauffman. New laws and incentives at all governance levels, however, could trigger an economic transformation that would ensure climate security. What Will A U.N. Upgrade Mean For Palestinians? 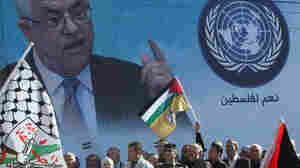 November 29, 2012  Changing one word for another — "entity" for "state" — will be symbolic and will give Palestinians access to such U.N. bodies as the International Criminal Court. November 27, 2012  France had broken with the United States once before when it voted to give Palestinians full UNESCO membership. France has become the first major European country to say they will side with the Palestinians. 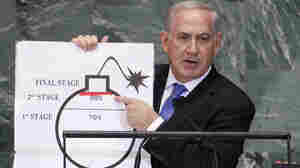 September 27, 2012  The Israeli prime minister will take his case to the U.N. General Assembly. Also due to address the delegates today: Palestinian President Mahmoud Abbas. 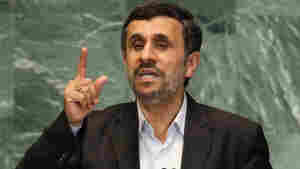 September 26, 2012  Iranian President Mahmoud Ahmadinejad used his eighth appearance before the U.N. General Assembly to elaborate on his vision of a new world order and criticize what he calls the world's "hegemonic" and "expansionist" powers. 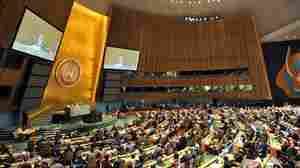 On 'Morning Edition': NPR's Michele Kelemen previews Day II at the U.N.
September 25, 2012  President Obama this morning addressed the opening session of the United Nations General Assembly. His message: slain Ambassador Chris Stevens and others who build bridges, "not his killers," are the hope for the future. 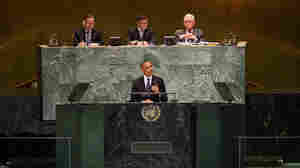 September 25, 2012  The president addresses the U.N. General Assembly today. He and Republican opponent Mitt Romney will also be speaking to the Clinton Global Initiative. August 10, 2012  The ongoing crisis is underscored by the enormous number of people who have been forced to flee their homes. While nearly 150,000 have sought refuge in other countries, far more have been uprooted but remain in Syria. August 3, 2012  The General Assembly is expected to pass a measure that reprimands the Assad regime. But it's being viewed as a largely symbolic gesture. Meanwhile, fighting continues. And neither side may be strong enough to win any time soon. July 19, 2012  China and Russia vetoed a U.N. resolution threatening sanctions against Syria unless it stops targeting and attacking civilians. June 16, 2012  The faltering U.N. peace plan suffers another blow as the U.N. monitors announce a suspension of their activities. They say they could resume operations, but only if conditions improve. 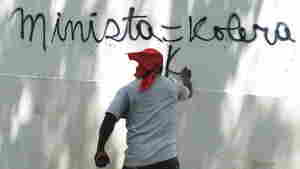 June 12, 2012  United Nations monitors have posted video of the deadly destruction they've seen. And in one village, a man angrily declares: "We are people! We are not animals!